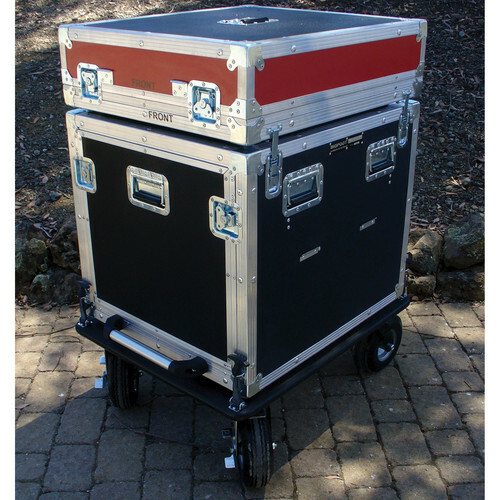 The BigFoot BH10RU/24D 10RU 22" Rack Wide Roadie Cube Cart is a 22” extra wide rack, which includes a 24” rack rail-to-rail depth. Its front and rear door panels are removable for complete access to the cart. The Cart’s Cube configuration provides users the ability to build an integrated cart while providing the capability of swapping in “groupings” of different gear. For transportation considerations such as smaller vehicles that need to break down the gear cube can be separated from a common base, cabinet, and lid assembly. The cubes of variable size and modules can be aligned independently, and built around aluminum shock mounted frames. The Cube Cart is made with anodized aluminum frames that are strong, yet light. The racks can be specified for MAC or PC computer considerations. The front and rear lift-out panels allow quick access for easy connections and equipment set up. The system can be ported and dialed in with quick connection panels for interconnect ease.